New figures show a slight increase in the rate of destruction of the Amazon rainforest in Brazil in the 12 months to the end of July 2013. Statistics from the Brazilian government show deforestation was up by 29%, slightly higher than the provisional figure of 28% released in November. 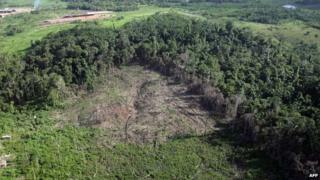 Satellite data showed that almost 6,000 sq km (2,315 sq miles) of forest were cleared during that period. The largest increases in deforestation were seen in the states of Para and Mato Grosso, where most of Brazil's agricultural expansion is taking place. More than 1,000 sq km (390 sq miles) have been cleared in each state. The increase has reversed several years of decline. The worst year since the Brazilian government began tracking deforestation was 2004, when almost 30,000 sq km (11,580 sq miles) of forest were lost. Besides agricultural expansion, the rebound in deforestation is due to illegal logging and the invasion of public lands adjacent to big infrastructure projects in the Amazon, such as roads and hydroelectric dams. Correction 23 September 2014: This report has been amended to clarify that the government figures are a revision of previous estimates rather than a new set of statistics.